A denture is a removable replacement for missing teeth and surrounding tissues. 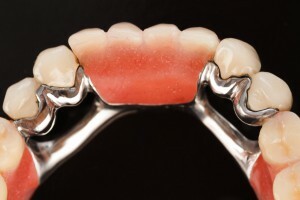 Two types of dentures are available – Full and Partial. Full dentures are used when all the teeth are missing, while partial dentures are used when there are some natural teeth remaining. Partial dentures are commonly used if you are missing one or more teeth. These are generally supported by a metal framework. Partial dentures are good for cosmetic and practical reasons to prevent your teeth from shifting into the open spaces. The process of fabricating a conventional denture usually begins with an initial dental impression of the maxillary and mandibular ridges. Standard impression materials are used during the process. The initial impression is used to create a simple stone model that represents the maxillary and mandibular arches of the patient’s mouth. This is not a detailed impression at this stage. Once the initial impression is taken, the stone model is used to create a ‘Custom Impression Tray’ which is used to take a second and much more detailed and accurate impression of the patient’s maxillary and mandibular ridges. Special impression material is then used for the final impression is taken of the maxillary and mandibular ridges. A wax rim is fabricated to assist in establishing the vertical dimension of occlusion. Afterwards, a bite registration is created to marry one arch to the other.